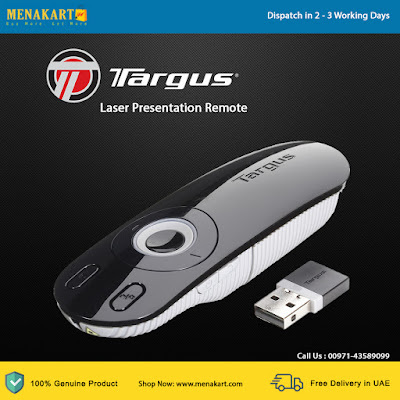 The Targus Laser Presentation Remote features a clear and intuitive button layout,making it easy to give presentations. Thanks to its 2.4GHz cordless technology, you’ll be free to move around and control your Microsoft PowerPoint or Apple Keynote presentation remotely, without wires and cords getting in the way. The patent-pending KeyLock Technology locks non-essential buttons when not needed to help eliminate accidental button presses. The integrated laser pointer allows the presenter to highlight important content while the backlit buttons provide visibility in environments with low lighting. The latest RF 2.4GHz cordless technology works fromup to 15metres away, providing flexibility while presenting in large conference rooms or classrooms. The mini USB receiver stores neatly inside the remote when it’s not in use for added convenience, so it won’t get lost or damaged. Both stylish and functional, the Targus Presentation Remote is your essential tool in achieving seamless presentation results.